At the beginning of the college season, I made a bold prediction about my Heisman winner: McKenzie Milton. That prediction quickly derailed after he had a less-than-ideal second game against South Carolina State and the North Carolina game was postponed. It also doesn’t help that Central Florida is a non-Power 5 school. Despite that uphill battle, Milton and the Golden Knights have stayed true to form in their last three games against Florida Atlantic, Pitt and SMU. It’s interesting that UCF was able to put up such a commanding win against Pitt because they are an ACC program and it’s impressive that Milton was able to add 328 passing yards and four touchdowns and 51 rushing yards with two more touchdowns to his resume. With only two games against Power 5 schools in their 2018 schedule, it was important for Milton to have a good showing against Pitt. It’ll be important that he has a good game against UNC, too, if it actually gets rescheduled. Saturday’s game against Memphis was another good indicator of this team and Milton. I expected the good times to keep rolling for the Knights and Milton in this matchup, and Milton had a solid performance. If I’m realistically lookin at the Heisman race, it’s unlikely that Milton ends up with it now that the season is halfway over. Other super star quarterbacks have stolen the spotlight. Tua Tagovailoa, Dwayne Haskins, Kyler Murray and Will Grier—the Big 4–lead the way for the ESPN Experts’ Poll Heisman Watch. Then there’s Milton bringing up the rear with one vote. He went down from the penultimate spot last week after an uninspiring game against Southern Methodist, but there’s still a silver lining. Milton suddenly faces a decent schedule in the second half of the season, and that could boost his overall season performance if he can play well against teams that are now gaining steam and are perceived to be better now than they were in September. For example, the South Florida games boasts more clout now that the Bulls are ranked. If that continues, then that makes for a much more exciting game than originally expected when the season started. Cincinnati is undefeated and is ranked 25 at the time of this writing. If those two teams are sill both unbeaten when they meet in November, then that alone will land on people’s radars. The game against Temple is also underrated. Temple is an under-the-radar program and has shown grit against bigger programs this season already. The pieces are there for a Cinderella story, but Milton will require a lot of help with his Heisman campaign. Some of the quarterbacks and running backs that have received more expert votes will need to falter for Milton to improve his standing. Some of them will and some of them won’t, so it’s ultimately up to Milton to decide his own destiny. If he can consistently come out with high-flying stats and over-the-top athletic performances, then he could still make a case. 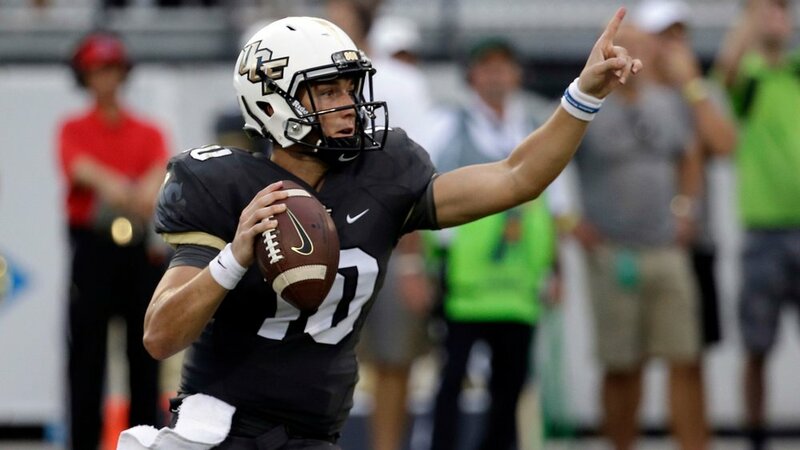 I’ll be watching with bated breath as I continue to root for Milton and the UCF program; now that they’ve cracked the top 10, I’m very much interested to see how they’ll figure into playoff scenarios, if they go undefeated for the second year in a row. My short answer is let them in; but the answer is never so clear cut. Here’s s hoping they do go unbeaten again, if not, then they’re still one of my favorites teams to watch.